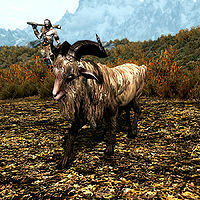 Gleda the Goat is a unique goat that belongs to Ennis of Rorikstead. She is very friendly, and will follow you when you talk to her. She can be found trailing after a giant called Grok, a ways south of Rorikstead, and, while the giant believes that he owns the creature, you may find yourself having to steal Gleda away from her large master in the quest A Night To Remember. Though the game data refers to Gleda as male, it is an unreliable source as all animals are considered male. Gleda will trail you anywhere and can take the place of a canine follower. She will not follow you into caves or some houses. Gleda will alert the guard if you engage in criminal activities and, as you cannot interact with her to make her wait, this makes sneaking past guards tricky. Gleda will sit and wait while you engage in battle but is virtually indestructible herself as she heals very rapidly. If you skip this portion of A Night to Remember (by either persuading, bribing, or intimidating Ennis), Gleda will eventually find her way back to her owner. This page was last modified on 1 September 2018, at 17:19.